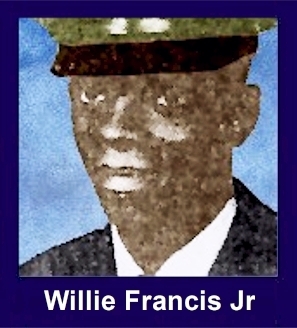 The 35th Infantry Regiment Association salutes our fallen brother, SP4 Willie Francis Jr., who died in the service of his country on June 21st, 1966 in Pleiku Province, Vietnam. The cause of death was listed as Booby Trap (Wounded 06/17/1966). At the time of his death Willie was 23 years of age. He was from Franklin, Louisiana. Willie is honored on the Vietnam Veterans Memorial at Panel 8E, Line 71. The decorations earned by SP4 Willie Francis Jr. include: the Combat Infantryman Badge, the Bronze Star with V, the Purple Heart, the National Defense Service Medal, the Vietnam Service Medal, the Vietnam Campaign Medal and the Vietnam Cross of Gallantry with Palm Unit Citation. Willie Francis Jr Buried in the Lutheran Cemetery in Franklin, LA. Franklin is located in extreme south central Louisiana about 50 miles southeast of Lafayette. Take exit 103 (Rt 90 S) off of I-10. Go south on Rt 90 about 50 miles to Franklin. The VA Headstone Application for Willie Francis says that he is buried in the Lutheran Cemetery in Franklin. The exact location of this cemetery in Franklin could not be confirmed by internet sources. The family of a Franklin soldier killed in Vietnam is awaiting news of when his body will arrive. William Francis Jrs. parents of Katy Plantation were informed June 23 by wire he died June 21 after an attempt to save his life by amputating a leg failed. The family received wires June 18 saying the soldier was wounded in the left leg, and June 19 saying the leg had been amputated. The elder Francis said Saturday he received a letter June 16 from his son in which the soldier told the family, "Things are tough" The letter was dated June 8. "He told me he was on a jungle operation called Paul Revere and had been out 50 days," the father said. "He wrote it had been raining almost every day the last three months and he thought he would leave Viet Nam in November." The Franklin soldier had entered the Army in September of 1964 after attending Willow Street High School through the 11th grade. Born and raised at Katy Plantation, William was an only child.